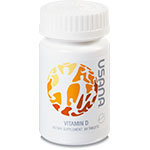 Vitamin D - Recent reports show that populations around the world are suffering from vitamin D deficiency. The problem is widespread and increasing, with potentially severe repercussions for overall health and bone-fracture rates. There is evidence that suggests vitamin D deficiency increases during the winter months because of decreased exposure to sunlight, although vitamin D deficiency may also occur during the summer months. USANA’s Vitamin D supplement is formulated with maximum strength vitamin D to ensure you get the vitamin D you need in one tablet.